I recently returned from the Consumer Electronics (CES) trade show in Las Vegas, and that question has been on my mind. The question doesn’t refer to any of the technologies vying to be the next big thing — although I do wonder how many Bluetooth controlled vibrators does one really need? No, what has me wondering is the big announcement ahead of CES about much tighter security restrictions. I wrote before the show that it would be a disaster with never-ending lines and disgruntled attendees, but that wasn’t exactly how it turned out. It was certainly chaotic, but it was a general surrender even before the event opened. Many of us wondered how these new security measures would accommodate our usual trade show behavior. Was there any hope of making appointments on time? I and my journalism colleagues were particularly pessimistic, because we’re expected to file stories from the press room, which means carting along a laptop computer and supporting electronics. And we hustle from venue to venue to meet people at appointed times. How would any of that work out when we had to stand in long queues wherever we went? As it turned out, CES — whose success has derived in no small measure from publicity — saw the light regarding us journalists and relaxed its new rules for members of the press. That was an orderly retreat. But it still intended to treat the unwashed masses to a full dose of security theater. From what I could see, though, those plans disintegrated in a most disorderly fashion. And in the end, the illusion of safety provided by security theater really fell away on our way home. 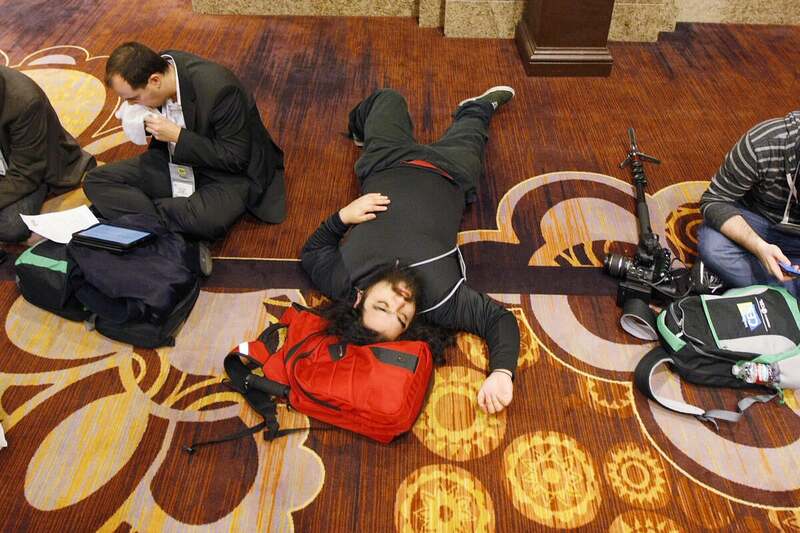 Just before I arrived in Las Vegas on Sunday, the CES brass decided to loosen its security rules for journalists. As press, our laptop bags would have to be checked only once, and for the next six days, a green tag would let security personnel know that the bag was perfectly safe. Yes, that’s right, one search served for every venue on every day. And me without any C4 plastic explosives and a timer stashed in my hotel room! As it turns out, though, the special exception for journalists wasn’t really necessary. That’s because CES’s “enhanced security” was a joke. It all fell apart early. My first clue that this was the case came only a few hours after I got I my green tag. Aiming to enter one room in the conference hall, I was directed to go to have my bag checked — and waved from the right side of a column to its left side. On the left side of the column, in an otherwise empty area marked as a security line, the other “guard” waved me on without glancing at me or my bag. Over the course of the week, I sometimes saw people’s bags checked, whether or not the bags were tagged. The “inspection” consisted of a quick look in the bag’s middle. There was nothing like a comprehensive check. All of those pockets that we had been warned against because they would take too long to search simply went unsearched. Metal detectors? There wasn’t one to be seen. Scanning wands? Same story. Security dogs? Nope. Additional guards? I didn’t see them, and I was in all the major venues: the Las Vegas Convention Center, the Sands and the Mandalay Bay. Some lines were long — long enough for one of my press brethren to sit down with his harmonica and start playing some mean blues — but, really, they were just typical, hour-long CES lines. I’ve been in worse lines at Disney World. If someone had actually wanted to carry a bomb or a disassembled M-16 into CES, it would have been simple. But you know what? I don’t want that kind of fear to rule me. We live in terror of terrorism in the United States, but then we resort to the placebo of security theater instead of real security to make us feel better. We’d be better off if we looked at it rationally. The odds of dying in any kind of terrorist attack worldwide are 1 in 9.3 million. That includes places like the Middle East, where real terrorism threats are much more a part of daily life. In the States, you’re far more likely to die of choking on a hot dog (1 in 350,000), binge drinking yourself to death (1 in 820,000) or being stuck by lightning (1 in 576,000). What’s really likely to kill you is heart disease (1 in 5), cancer (1 in 7) or a car accident (1 in 8,000). Number of people killed by rogue ISIS agents on the Vegas Strip? Zero. It’s not that I don’t take terrorism seriously, but I try to put it in perspective. And I can’t help but think that the point of terrorism is to terrify. If you live in fear, the terrorists win. Maybe you don’t agree that what CES promised to deliver — but bungled badly — only amounts to security theater anyway. And maybe you believe that the TSA’s no-shoes, no-water-bottle rules are legitimate ways to address real threats. Well, I think even someone who buys in to all of that would change their mind if they had been with all of us CES attendees at Las Vegas’ McCarran International Airport as we all headed back home. The lines were horrible, early on Friday morning. Even though I was two hours early, I began to doubt I’d make my flight. Then the line sped up to the point where we were almost trotting. What had changed? TSA threw out its security protocols. We were told to leave all the items we normally must take out — laptops and travel-sized hygiene bottles — in our bags. We were told to put our wallets, smartphones and other such items in our luggage. Shoes? Belts? Keep them on! And off we dashed, most security restrictions tossed out the window for the sake of speed. The farce that is security in the United States was revealed for all to see. Oh, I made my flight. And there were no terrorism attacks that day.